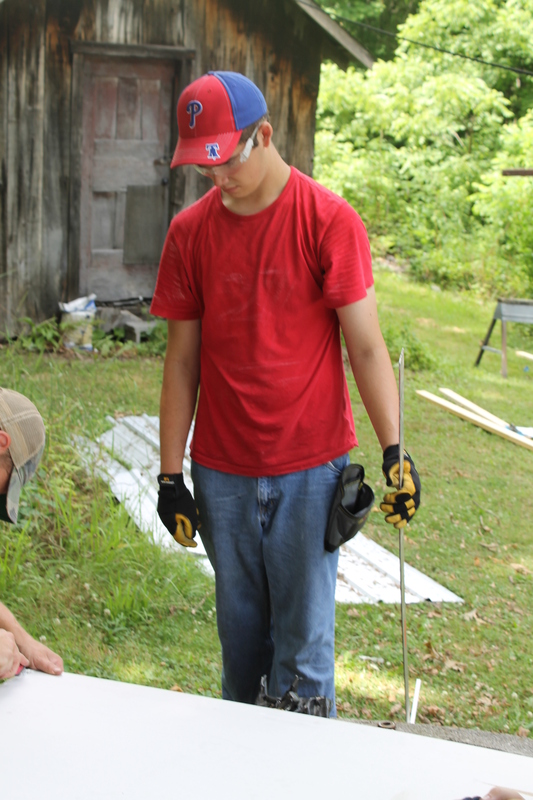 From June 28 – July 4, 2015, 18 volunteers from St. Luke Lutheran Church spent a week serving with Appalachia Service Project. 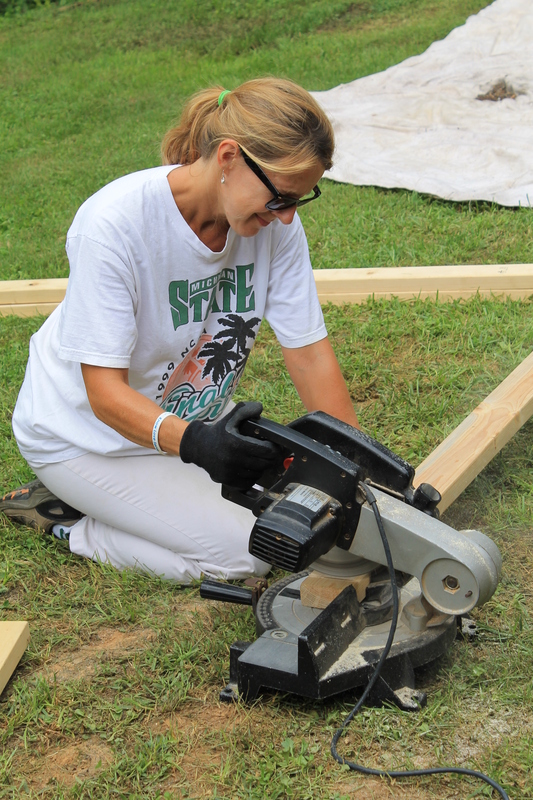 They traveled to Washington County, VA and did work to make 3 homes safer, warmer, and drier. This page is headquarters for updates throughout the trip and will remain as an archive of this important mission. 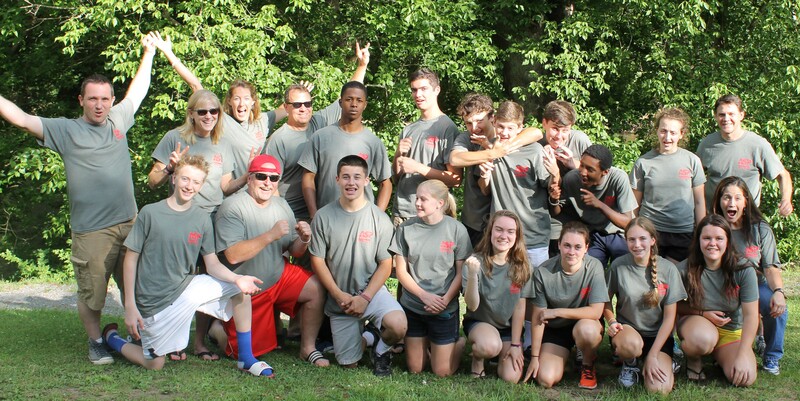 The ASP team and their families met at St. Luke for a cookout and packing of the vans. Heavy rains brought the cookout indoors, but the vans were packed and the team will be ready to go in the morning. 5:40am – Everyone met at St. Luke, said goodbyes, prayed together, and were on the road by 6am. 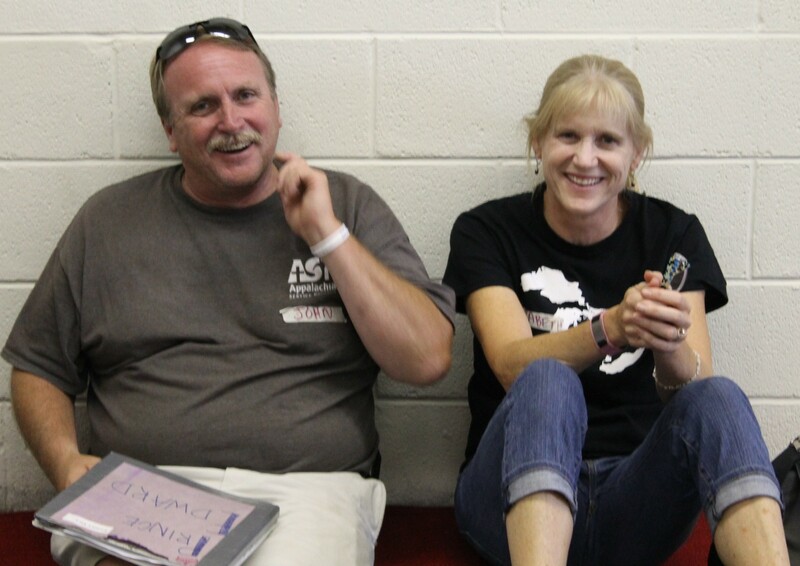 3:30pm – The teams arrived at Rhea Valley Elementary School in Meadowview, VA. Sleeping quarters were set up in the gym and the team met volunteers from other churches, including St. Andrew’s Lutheran Church from Perkasie, PA! The three teams headed out to meet the people they will be serving and to begin work on their projects. All 3 teams reported a successful start to the week, including good experiences with both their work and their new friends. Team Belted Galloway finished the last corner of siding on the outside of their house, picking up where previous volunteers finished last week. The St. Luke team enjoyed ice cream together Monday evening as they shared stories about their sites. Another great day! Team Longhorn tiled two bedroom floors and primed the roof, which will receive covering on Wednesday. Team Belted Galloway all had a turn using the circular saw as they prepared the back of the house for siding. They also removed the framing from a tub that will be replaced with a larger shower that will be more accessible. They enjoyed sitting on the porch while having lunch with their family. From Team Pineywoods: Pineywoods has made great progress over the past couple of days. On our first day, we met our family, a couple with three kids. Their trailer home needed repairing and painting in a new nursery and a new floor in the girls’ bedroom. The Pineywood People (a.k.a. Tommy, Natalie, Katharine, and Philip) have sang a capella nonstop at the work site, on the road, and even while cleaning the showers. The experience has been eye-opening and enjoyable. Piney Woods has been a blessing for all of us. Whoever assigned us to this home was listening to God. The family is so comfortable with us there, as we are too. 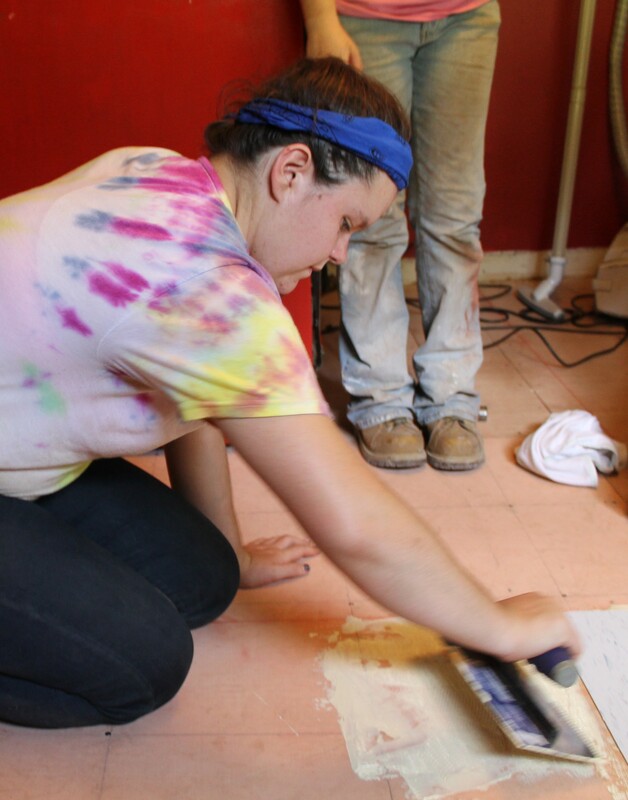 We are putting in a new floor and painting a nursery and kitchen wall and building relationships with God’s love. The evening “culture night” program featured Ms. Debbie, the principal of Rhea Valley Elementary School, who delivered a deeply inspiring talk about Appalachia, “her kids” at the school, and the great good that she has seen done by ASP volunteers. Another great day! It began with rain again, but cleared up by the time we were ready to head out to our sites. Team Longhorn put SBS roofing material on half of the roof today. It has a VERY strong adhesive backing and after the learning curve it went down well. It is kind of like wrapping the roof in a waterproof membrane. They finished cutting the tile in one room and a 3/4 of a 2nd room. The children are getting much more comfortable with the team; it seems their favorite target to tease is Amani. Using donations from home, we were able to purchase an egress window for the children’s bedroom at the Team Longhorn home. The evening gathering included participation in a prayer walk. It was a nice reflection time. Then it was of to try out the OTHER ice cream shop right near the Appalachian trail. Several of our youth decided to sit in on the staff meeting, which gives them the chance to consider spending a full summer as an ASP staff member. Day 4 was a little wet but still productive! 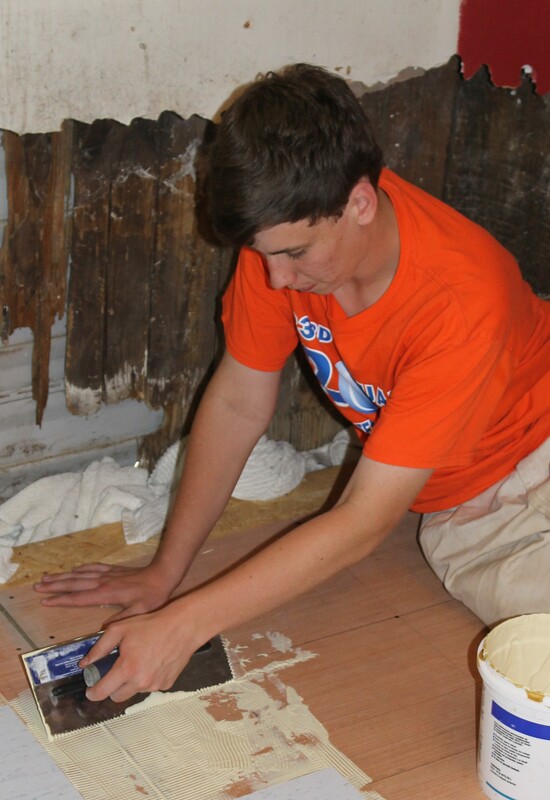 Team Longhorn worked on the roof until the rain started, then moved inside and finished the floor in the girls bedroom. They then started replacing the drywall in the bathroom. From Team Belted Galloway: the new shower tub and framing are done as is all of the plumbing! We worked on waterproofing between the siding and the eaves. We ended the day on the porch with our family enjoying some watermelon. From Team Piney Woods: We finally saw our efforts turn into a floor! Katharine, Natalie, Tommy and Philip spent hours installing luan flooring on top of OSB flooring on top of stronger joists and braces to support the floor. That was 4 days of effort and the result is a nice flat floor that is ready for VCT floor tiles. We will do that job tomorrow, Friday our last workday. We have been truly blessed to spend this week with our family of 5 and they had so much fun at dinner tonight playing with us on the elementary school playground. We have spent great days with them in their trailer home singing, reading and of course playing and I would add sharing God’s everlasting love. Mr and Mrs Gilbert are so proud of our crews’ endless energy and all of our St Luke’s(18 in all on this trip). You cannot imagine just what an impact you will have as an ASP volunteer until you get down here and just do it. Your hands doing God’s good works. The evening featured the ASP picnic, which included ASP staff members agreeing to hair cutting, pie throwing and hair dyeing as they celebrated fundraising success. The day ended with the St. Luke ASP tradition of liars dice! We Need Your Opinion! HS Sunday School! We are getting ready for another great year at St. Luke. We are really excited for the High School group that meets during Sunday School. Things came together really great last year, and there’s a big group of 10th graders that have now completed confirmation. Getting to know each other better and better throughout the year. Discovering stories of the Bible and how they matter in our lives today. Finding out ways that we (and other people) live out their faith. A few ideas are “brewing,” but I really want to hear from YOU! I have been amazed at how smart, talented, funny, and faith-filled the young people of St. Luke are. It is important that all of you are involved in planning this class. Listed below are a few ideas that have come up. I’d love to hear what you think! Do you like all of thiese ideas? Some of them? NONE of them? Do you have any questions? EVEN BETTER: Do YOU have an idea of how we could spend time on Sunday morning that would help us meet the goals above? You can either comment on this page or email me! IDEA #1 – “ECHO THE STORY” for exploring the Bible together. After the video, everyone listens as a story is told. The stories are read in a way that shows how interesting, moving, and fun it is to hear a good story. While the story is read, everyone has a sketch journal to doodle or write in as they listen. Here is what some of the pages in the journals look like. With journals as a tool to help us experience and think about the stories, we are able to discuss how God’s story connects to our own stories and is meaningful in our lives. IDEA #2 – FAITH STORIES – What following Jesus looks like. Wouldn’t it be great to hear from some people about how their faith influences the way they live their life? We can devote some of our Sunday mornings to listening to someone tell us their faith story and then discuss with them what their faith looks like as they live it out. What do you think? Are there particular people (youth or adult) that you would like to invite to share their story? We can also spend some of our Sundays discussing topics that matter in the real world as we try to see ways that our faith can make a difference. It would be really great to get groups of 2 or 3 teens to pick a topic they are interested in leading and come up with a way for the group to learn about it and discuss (perhaps through sharing video clips or telling a story or sharing some information you’ve learned). What do you think? What topics would be great to discuss? Is there a topic you would like to help share with the group? For the last 2 years, there has been a really great spring adult class called ANIMATE. Using videos, ANIMATE has explored really great topics about Faith, God, and the Bible with help from speakers including Nadia Bolz-Weber and Shane Claiborne. Many times I have thought these would be great discussions to have with youth. I’m wondering what you all would think about spending 7 weeks in the spring in a class that would be about 50/50 youth and adults (of all ages) having these interesting conversations? So…there’s the ideas that have come up so far! PLEASE SHARE YOUR THOUGHTS AND IDEAS! I can’t wait to see what God does this year! You can share your ideas by replying/commenting below or you can send me an email. THANKS! 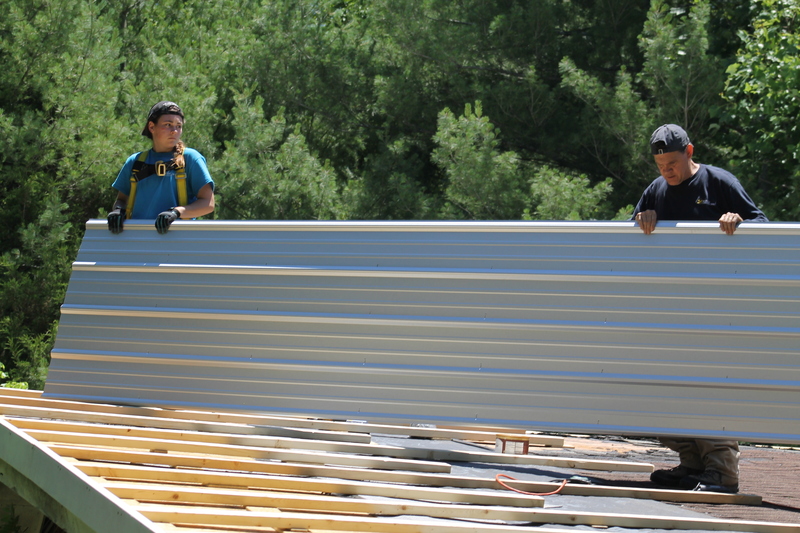 Team Simbo gets their first sheet of tin on the roof! It’s the Fourth of July and the weather couldn’t have been more beautiful as I set out with Team Simbo for our final day of work on the roof. The temperature was down, humidity was gone. 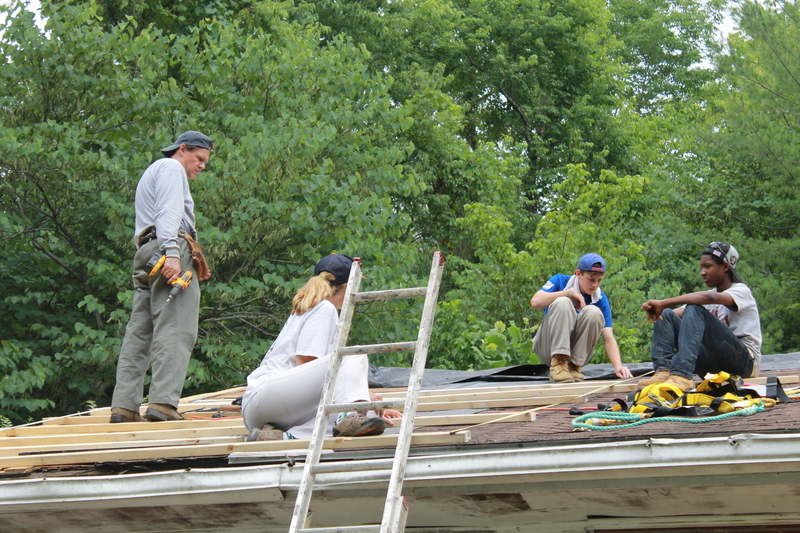 There was a lot of work to be done, but the team was glad to start putting on the tin roofing. Two full sheets of tin were installed along with the end cap. 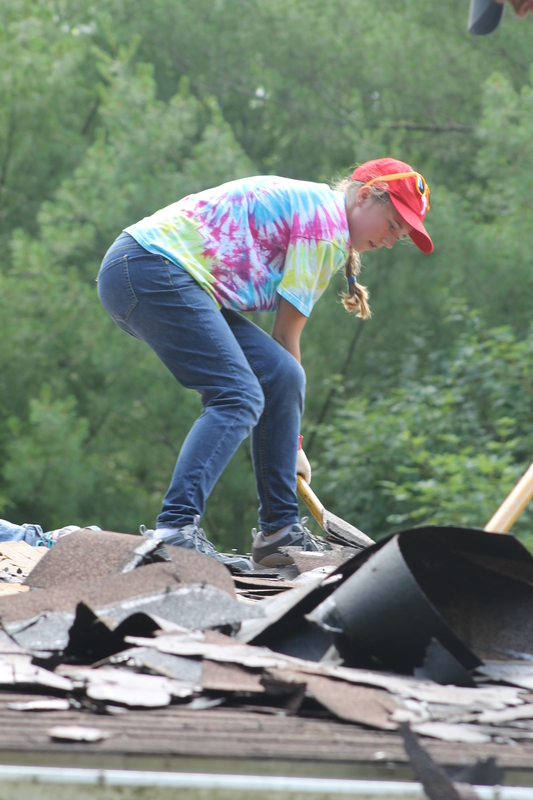 The team cleared a great deal of construction debris that had gathered and also made sure the roof was protected from any rain that might come and ready for next week’s team to succeed. Team Prince Edward headed to their final work day after a truly amazing Thursday night. They were invited by the family they are helping to come to a holiday celebration in Cleveland, VA. There was Bluegrass and Gospel music being played by local musicians along with fireworks. The best part was that the team members were treated like extended family who just came home: they were taken around and introduced to most everyone in the town. It was Appalachian hospitality at its finest! Today, they were glad to see their kitchen project come to completion. They also forged a strong connection with the family they were helping. Before leaving today, the team was asked to sign their names on an extra floor tile that the family wants to keep in their living room. Team Agua was excited to see their work come to a satisfying conclusion. The ceiling was finished and the team was able to return the room to the way that the woman they are helping wants it: filled with dolls, bric-a-brac, and meaningful memories from over 92 years. The team shared goodbyes with the woman they helped and it was clear that everyone was changed by the work of this week. Team Simbo at the end of their work week. After dinner, the entire ASP center gathered and every individual took a turn sharing their “God moments” or meaningful insights on the week. The discussion took nearly two hours, but everyone was engaged throughout and truly blessed to hear all of the ways that God had been working this week. I was so very impressed and proud of what our youth participants had to share. The adult leaders, too, shared heartfelt reflections on how we were impacted. As the sun was setting, I gathered the St. Luke team outside and told every single one of them what I think of them. Then we rushed off to enjoy the local fireworks display, a last stop for ice cream and one last hour of games before hitting the air mattresses. Tomorrow morning we drive! 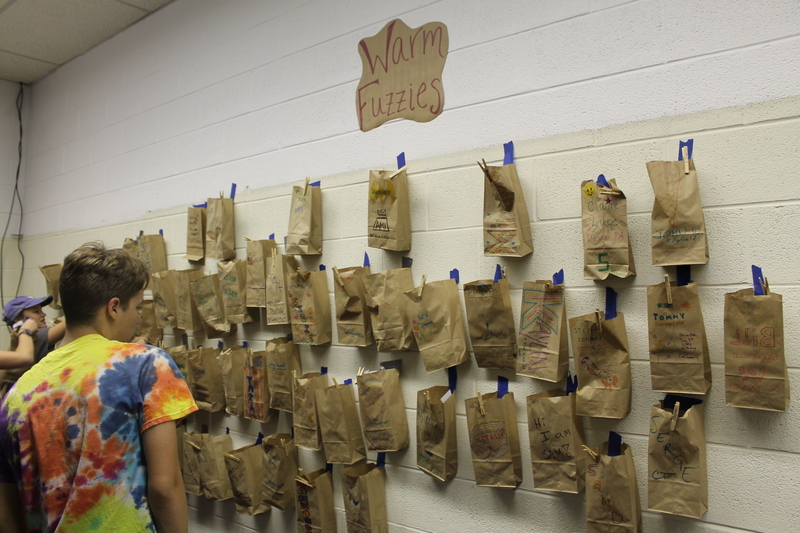 ASP has a tradition called “The Warm & Fuzzies Wall.” Volunteers decorate a brown paper bag with their name on it. Throughout the week, everyone is encouraged to write down notes of affirmation and encouragement and place them in the bags. I decided that my handwriting is too sloppy for handwritten notes. More importantly, I wanted to share these affirmations not just in person, but with everyone. I want the whole world to know what an incredible group God brought together to make this week an amazing blessing and a wild success! What is written below is what I shared in person with each team member after our final day of service in Wise County, VA.
Kaylin B. – You jumped right in on the first day without hesitating to do the hardest work that needed to be done, and just kept going! Even when you got worn down, you kept a great attitude and were smart enough to take a rest and then bounce back up and keep on going. Your Kan Jam skills are also not to be denied! Thank you! 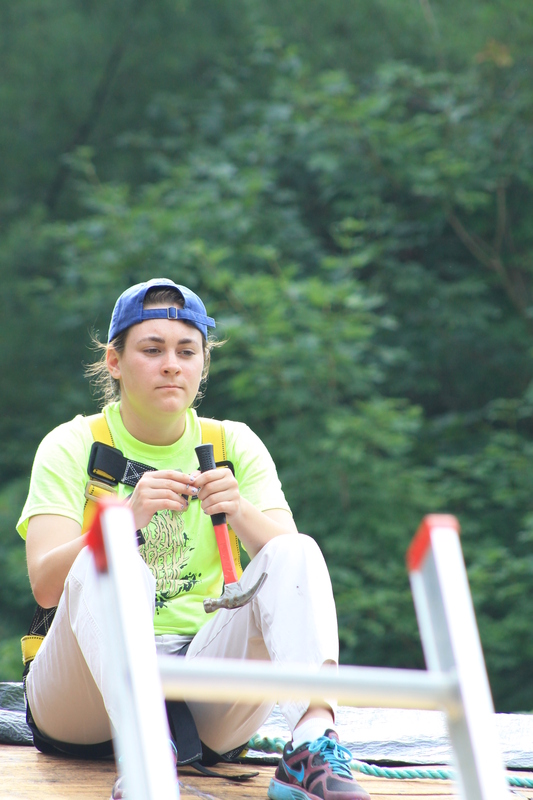 Emily L. – It was so much fun to watch you on your first ASP trip. You worked hard. You took time to connect with the children next door to your work site. I also thought you gave a great response during evening gathering. Your description of poverty being a cycle was so smart and really showed that you are working to understand and respond to the needs of your neighbors. Thank you for coming to ASP! Gabe H. – Thank you for bringing all of your energy and style to ASP, especially during the World Cup! I was impressed with how well you stepped in and did whatever job you were asked to do. You’re a lot of fun to be around and everybody knows it. Mason M. – You were such a smart worker this week. It was great to see how easily you could take instructions and take the lead on getting a task done that kept the job moving. You did a great job last year of showing excitement for ASP and now you have two different experiences that will make you even better at future projects and getting other people to give ASP a try. You also know how to take a wiffle ball to the head like a champ! Thank you. Claire L. – I was delighted and surprised when you signed up for this trip. It was clear that you were stepping out of what you (and all of us) are used to, but also that you were ready and excited for the challenge! Way to go climbing up on the roof and running the chop saw! Throughout the week you showed an interest in better understanding the people of Appalachia as well as the reality of the struggle many people face. Thank you for taking this week to let your light shine. Detroit, here we come! 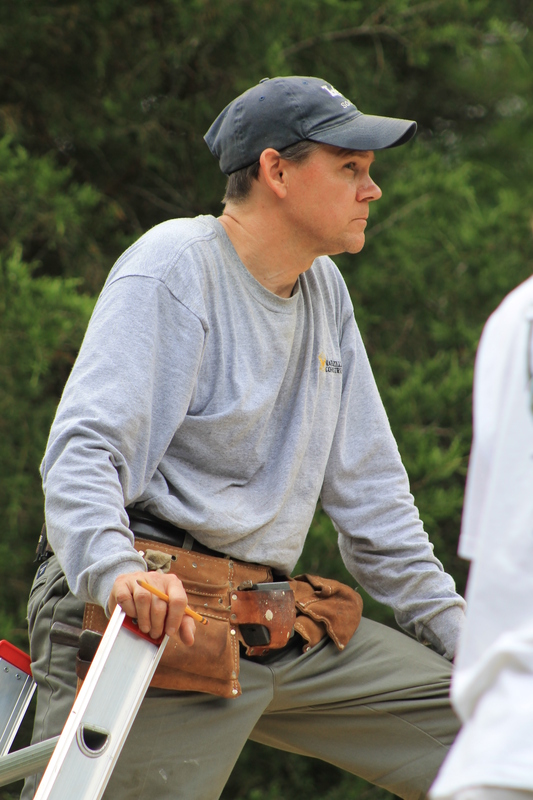 Steve M. – Thank you for your dedication and commitment to doing the best possible job in terms of both working on the house and in having a lasting impact on all of the trip participants. You were a work horse on a truly challenging project. You bring a great combination of determined focus and gentleness that shined through the way you equipped your team, wrestled with your project and helped lead this trip. Mike S. – You’re a great leader because you’re always ready to help where needed and people like to be around you. You didn’t hesitate to join in dancing with our new local friends, even though it was something new. Just like last year, playing music together was also a blast! It’s really clear that ASP is a part of who you are; I’m glad you’re thinking about being on staff. You’ve got great questions and thoughts about God and faith, too. Thank you! Amani H. – You did such a great job this year as one of our returning veterans. You were a leader and offered some really important thoughts when your group was discussing God moments and how our faith is being shaped this week. You were also full of laughter at all the right times this week. Thank you for being such a great member of the group. 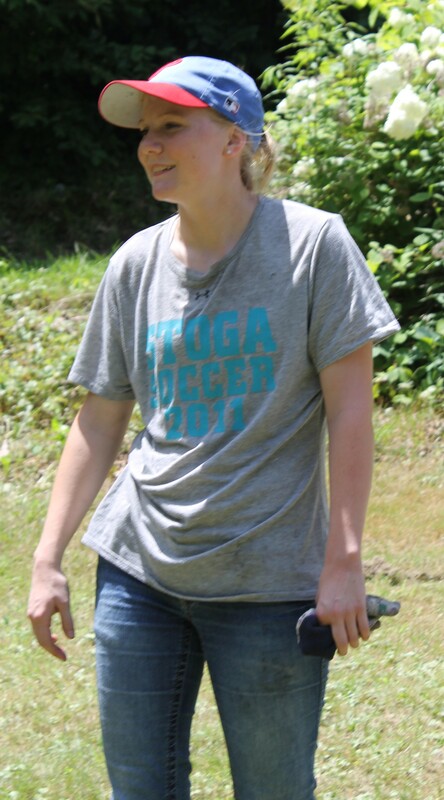 Tommy S. – I’m really glad you came to ASP this year. It’s been great getting to know you better and seeing how quickly and naturally you jumped right into your team and the work at your site. I loved hearing you reflect and share during our faith discussions. I’m also glad you took time to look into the possibility of ASP staff. 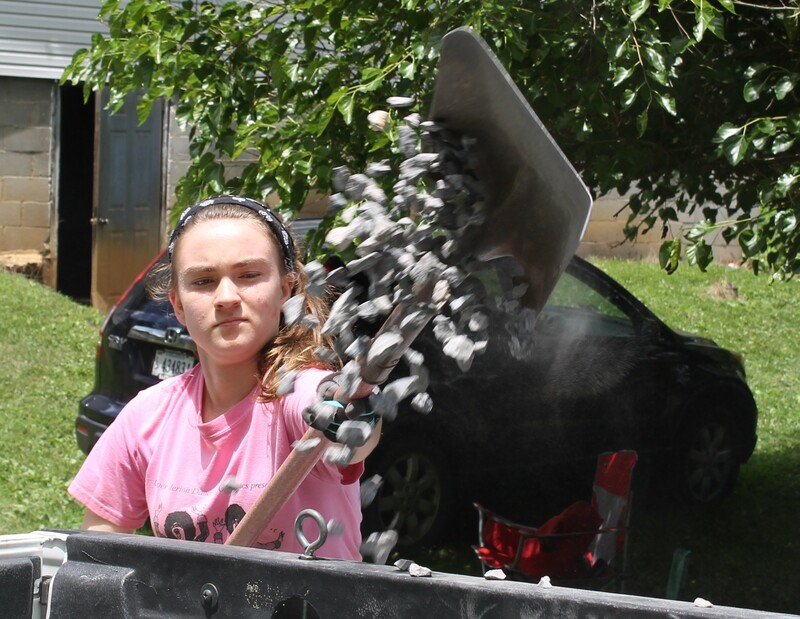 Natalie M. – Just like last year, you were always happy to be helping out in whatever part of the job needed to be done. I’m glad you are thinking about ASP staff. It was so great to see you there on Thursday when I went through border patrol with my team. It looked like you belonged there! Great job! Miranda M. – I was impressed all week long by how you constantly paid attention. 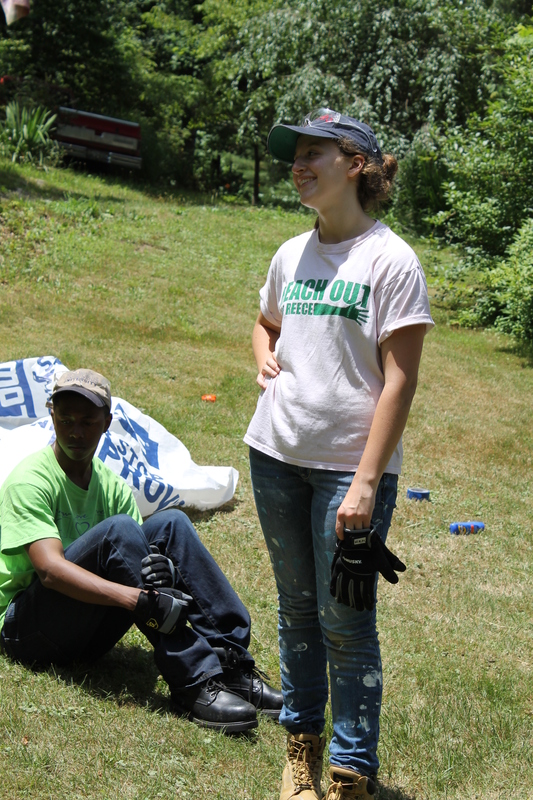 You were thinking through tasks and the job as well as the reality that people in Appalachia face every day. If the opportunity arises, you will be an awesome ASP staff person. Thank you! Dave W. – Thank you for being willing to step out of your comfort zone and lead a project. You used your lack of expertise as a way to pull your team members into figuring out solutions together. It was almost like you were bluffing to get the team to rise to the occasion. Either way, it worked and the team was equipped to serve. Great job finding New River’s Edge for us, it was an absolutely fantastic experience. Kim S. – I’m glad I ended up able to come on this trip, but it is absolutely clear that our group had not only a trip leader, but also a spiritual leader. Thank you for pouring your heart and soul into this group, this trip, and into connecting with the woman your team served this week. 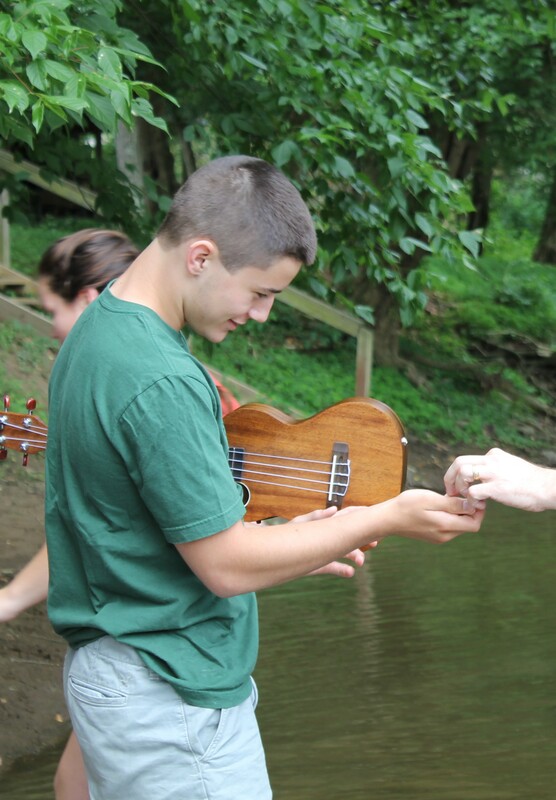 You sparked faith discussions at the river and during the week that are some of my favorite “God sightings” this week. Thank you, thank you, thank you! Sam M. – You really came back as an experienced ASP veteran this year! It was cool to see how confident you were about jumping into jobs at the worksite. It’s clear that you will really be a leader when you come back again. Great job! Thank you! 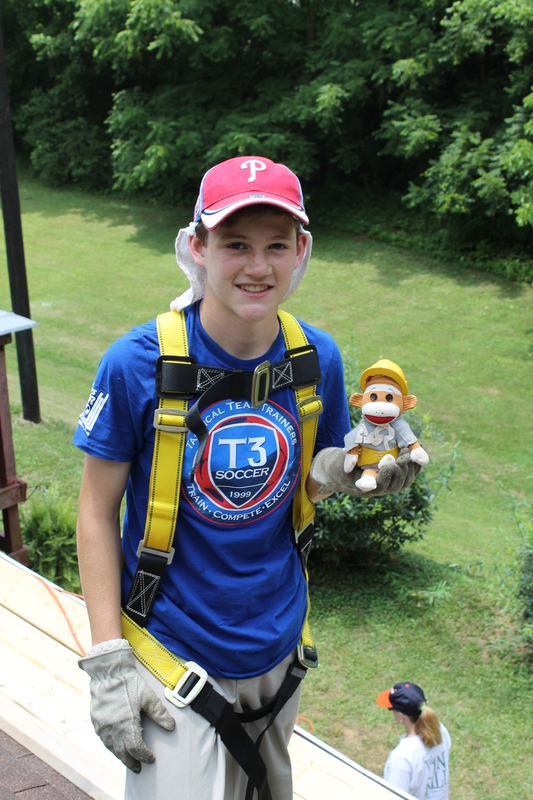 Tommy W. – Thank you for keeping everyone smiling and always being ready to jump in to lend a hand. Your friendliness really made our group stronger and helped us connect with the Connecticut crew, too. Harrison C. – It took a lot of commitment (and a great mom) to drive all the way down yourself in order to be a part of ASP. You brought a fun attitude and a good team spirit to your team and to the whole trip. Thank you! Gillian H. – Again you proved yourself ready to take on any job. Extra bonus points for bringing Shannon along to make our trip even better. 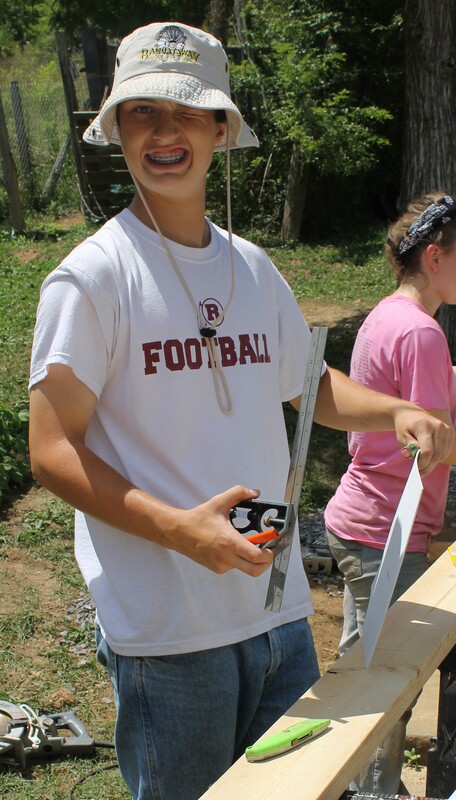 I definitely can imagine you in ASP overalls driving a big white truck and getting everyone excited to serve. Elizabeth M. – Thank you for being constantly at work behind the scenes to make this week unfold so wonderfully. You took pictures, you handled paperwork, you made sure your team had everything they needed not just to learn and complete their tasks, but to also have a pleasant and rewarding experience. John M. – You’ll always be too friendly to be given full credit for your sarcastic wit. Thank you for leading your group into their work in a way that was organized and understood by everyone with a constant atmosphere of relaxed fun and comradery. As always, you stepped in everywhere to lend a hand quickly and offered a friendly greeting to every person along the way. Thank you, everyone, from your awesome ASP 2014 Team! Many thanks are also due to everyone who made this trip come together! Special thanks to Robby Gilbert, Ron Harmon, Bill & Jackie Baver, Roberta Menapace, Conrad Ogletree, all the parents of our remarkable youth participants, and everyone from St. Luke Lutheran Church and beyond that provided support and prayers (especially the Youth Ministry Team, Social Ministry Team and Congregation Council). God has indeed accomplished something this week and made all of us a part of it! Team Simbo making progress on their roofing project. Thursday morning (work day 4) began again with morning devotions, which focused on the importance and virtue of patience. After breakfast, everyone sprung to action as we can now get a picture of what work can be done during the final two days of our week at ASP. In exciting news, several youth from St. Luke expressed an interest in learning more about becoming ASP staff members in the future. Today, Miranda M., Natalie M. & Tommy S. shadowed the ASP staff as they sent teams out in the morning and did site visits to deliver supplies and support to the work teams. Miranda M. & Michael S. are both scheduled to shadow staff members on Friday. I made my way back to Team Simbo today. We made an extra effort to arrive early at the site to try to get working before it got too hot. Upon arriving back at the site after 2 days away, I could quickly understand why this job has been frustrating and challenging. I could see that a great deal of work had been completed, but it was primarily addressing unexpected trouble in the roof substructure. The work that was done was slow and difficult and, although a lot has been accomplished, really only brought the progress of the job back to where we thought it was on Monday. 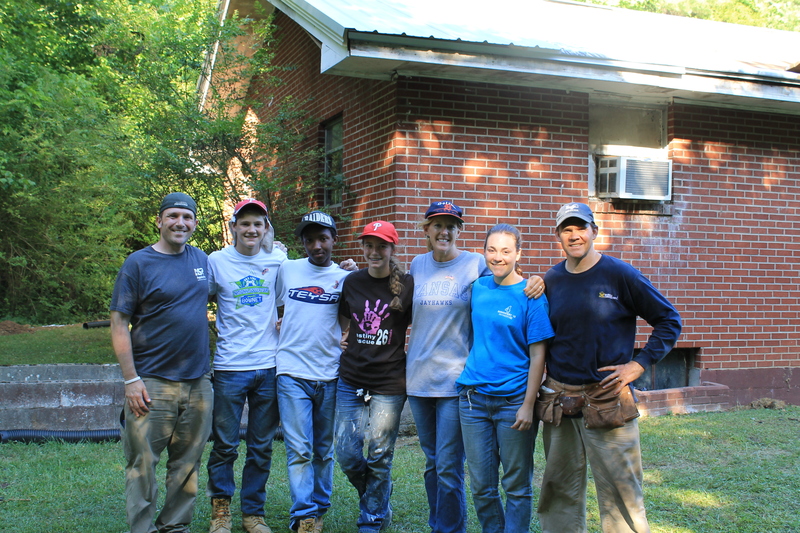 The crew from Connecticut that was working at the same house was moved to a new project. Gabe H. & Mason M. joined me in finishing a last piece of their indoor work: re-attaching a baseboard heater to a bedroom wall. On the roof, the crew was glad for cloudy skies without rain to make conditions a little bit easier. 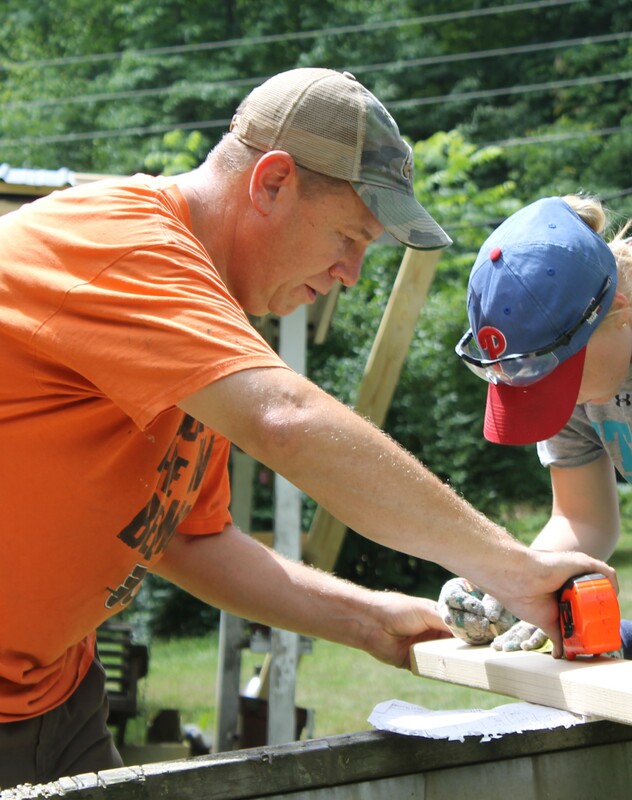 Steve M. along with Emily L. & Kaylin B. put down some water protection over seams in the new decking and then began setting wood beams (purlins) that the new tin roofing will be attached to. The ground crew (Claire L., Gabe H. & Mason M.) provided support by cutting lumber as needed and sending it up. 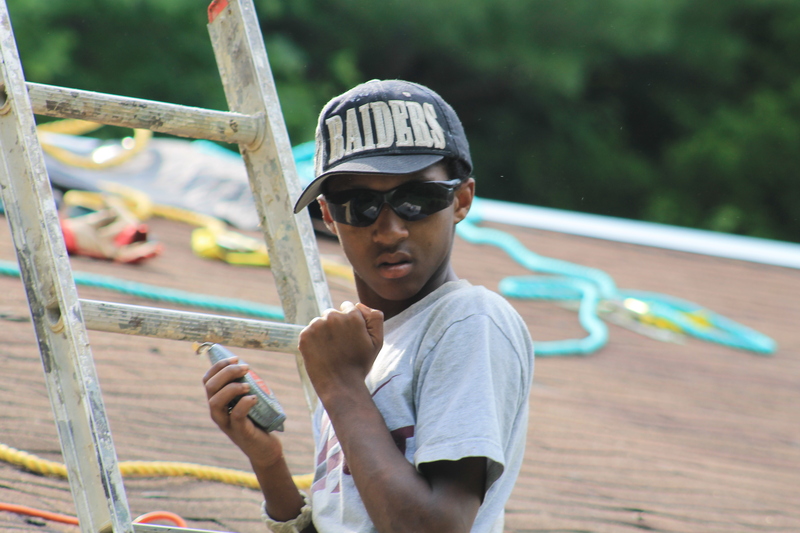 After lunch, I joined the roof crew. When the sun came out, it was instantly exhausting. This team (and especially Steve M. who has spent all day every day on the roof) a big shout-out! Team Prince Edward finished tiling the kitchen floor. They were excited to find out that the last row of tile along the wall were just the right size that they did not need to be cut! Another concern about moving the refrigerator back into place under a cabinet was also relived when it was determined that the cabinets are to come down next week to allow for wall repair. When they are rehung, there will be plenty of clearance for the refrigerator. 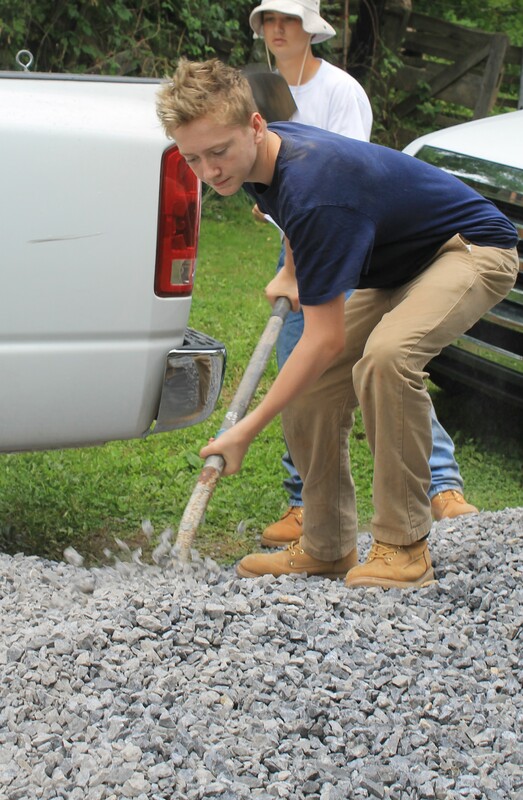 The team also spent time spreading some of the remaining stone pile in the driveway. 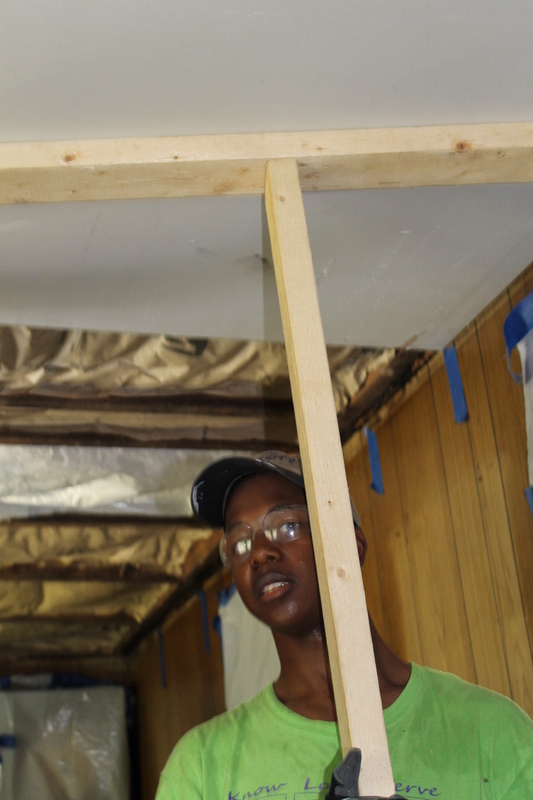 Team Agua had a good day of progress after the challenge of drywalling the ceiling. Conditions were good for them to get three coats of spackling done, so tomorrow will be the final sanding and painting. Work was also done on trim, which proved tricky but came together. The other big accomplishment came from cleaning the walls. Finding out that a coal furnace exploded soot throughout the house a few years ago, the team scrubbed the walls and found a much brighter room. They also took all the boxes of bric-a-brac that are to be housed in the room and laid them out in the yard and cleaned each one individually. When the team departs tomorrow, they will leave a much nicer front room! Having fun at the ASP picnic. 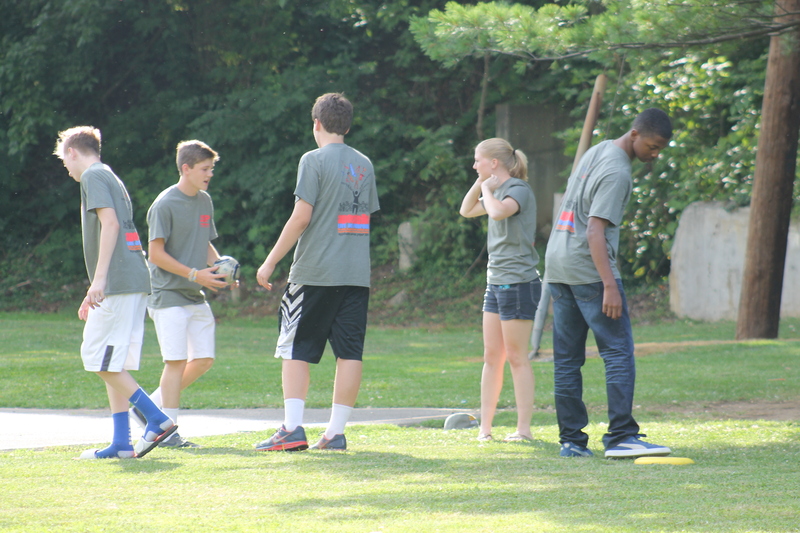 After the work day was finished it was time for the ASP Community Picnic. The weather could not have been better and we had a lovely long evening in a local park along the Cinch River. As is tradition, we invite the families we are helping to join us for the picnic. The women that teams Agua and Simbo serve were unable to come due to health and mobility problems. Ruth, the 92-year woman Team Agua is helping sent along words of appreciation along with a food donation for the picnic. The family that Team Prince Edward is helping was able to attend and everyone was very happy to meet them. After a delicious picnic dinner, several members of Team Prince Edward went with their family to enjoy some early 4th of July festivities. Everyone else stayed at the park until dark. We played Frisbee games, laughed a lot and really enjoyed being together. This is a remarkable group of young people with just the right adults accompanying them! We’re also seeing a lot of friendships forming with youth from the Connecticut churches. 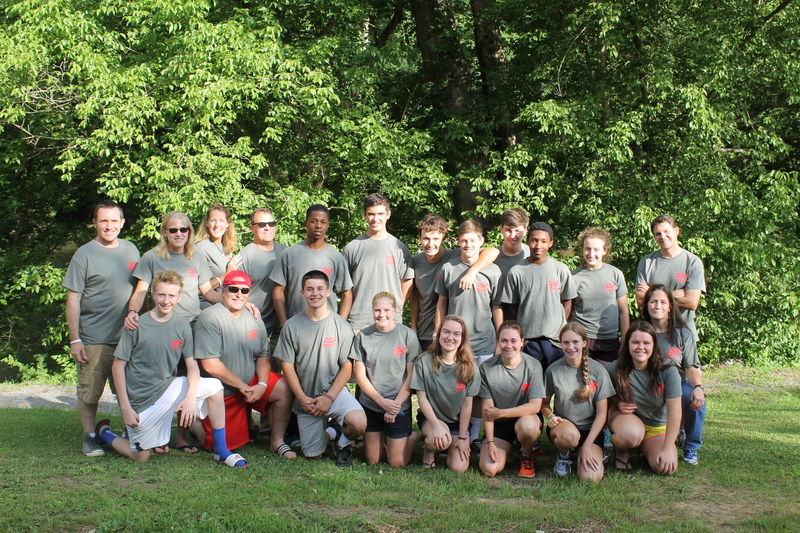 The St. Luke ASP Team for 2014! As evening settles in before our final work day, there is a relaxed sense in the air at the ASP center. Some are relaxing and reading. Some are talking with new friends. One guy is writing a blog and posting pictures to Facebook as he says good night!